1. position a rack in the middle of the oven and preheat to 350 degrees. line a standard 12-cup muffin pan with paper or foil liners. 2. in a bowl, whisk together the flour, baking powder, baking soda, salt and cinnamon. in another bowl, whisk together the grated carrots, sugar, oil, eggs, buttermilk, and vanilla to combine. using a rubber spatula, fold the flour mixture into the carrot mixture until completely combined. 3. divide the batter evenly among the prepared muffin cups, filling each about two-thirds full. bake until golden brown and a toothpick inserted in the center of a cupcake comes out clean, 20-25 minutes. let the cupcakes cool in the pan on a wire rack for 5 minutes. transfer the cupcakes to the wire rack and let cool completely, about 1 hour. 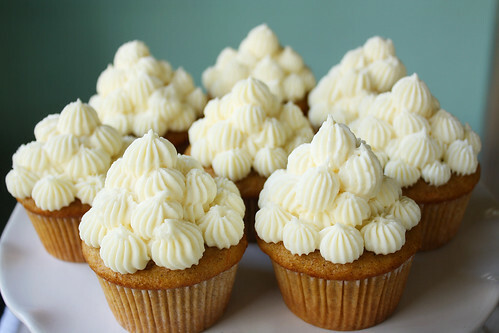 4. in a stand mixer, beat all ingredients frosting ingredients on medium until fluffy. chill the frosting for 10-20 minutes, until it has set up enough to spread smoothly.